I know that movies especially animated films are hard to make. I don’t get any special pleasure or glee out of giving a movie a bad review; however, I can’t lie and say something is good when it isn’t. 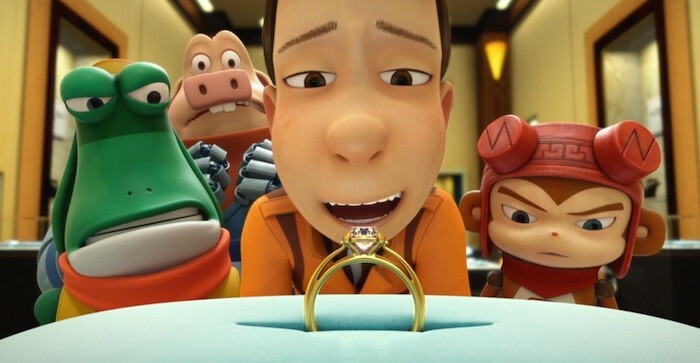 Recently I had the chance to view a new animated film out of Korea called Bling and I’m afraid it’s a big huge mess. Let’s start with a few good things about Bling. The animation isn’t half bad. It’s bright and colorful and doesn’t have that ill-rendered quality of many low-cost CG efforts. Also the voice cast is fine including Taylor Kitsch, Jennette McCurdy, James Woods, Carla Gugino, Tom Green, Jon Heder, Jason Mewes and more. So Sam grows up determined to propose to Sue with a great ring. The strange thing is at one point he seems to be introduced to her for the first time and then other times they seem to have a relationship. She says she’s been waiting for him to propose for 20 years. Given they can’t be more than 25ish isn’t that an odd thing? 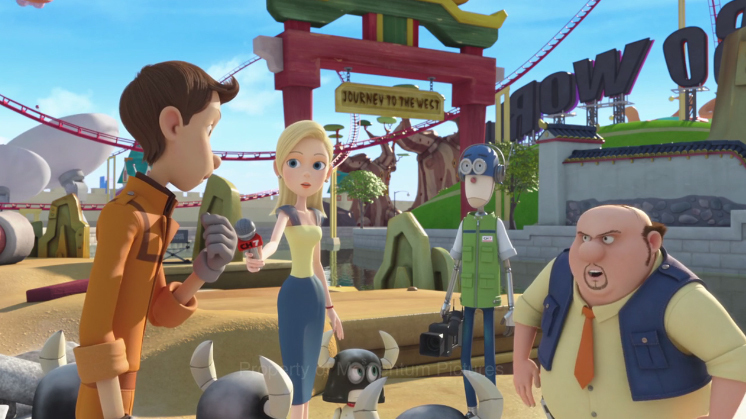 Sam is a robot maker for an amusement park and his troop of robot friends could be fun but they are mostly spastic, crazy, loud excuses for toilet humor. The action in the film is so choppy and bombastic that I became exhausted by it. There are also robots who are the most obvious Minions rip-offs I’ve ever seen. I mean look at them? They literally look like white Minions! 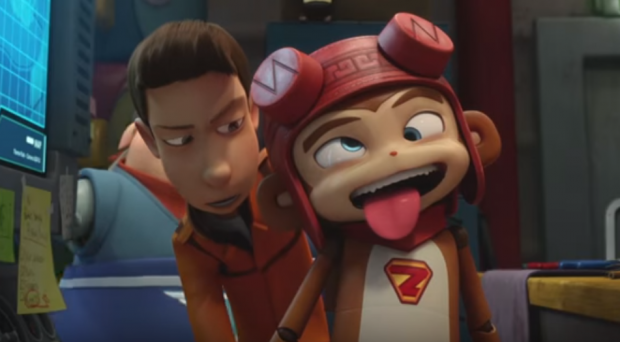 The villain Oscar also has a robot named Victor who seems to be the only voice of reason in the film. He tells Oscar he is stupid for wanting to propose to Catherine and that the search for the ring is dumb. And yet he’s the evil bad guy? There’s always a problem in a film when the bad guy is the level-headed one. They do try and tie it up with a non-consumer message–that love is all that really matters but then they break it by Sam giving the high-cost ring anyway! The final scenes for Oscar are also bizarre with him still professing his love for Catherine. How can he love her? He doesn’t even know her? It’s such a confusing message for kids (and adults for that matter). 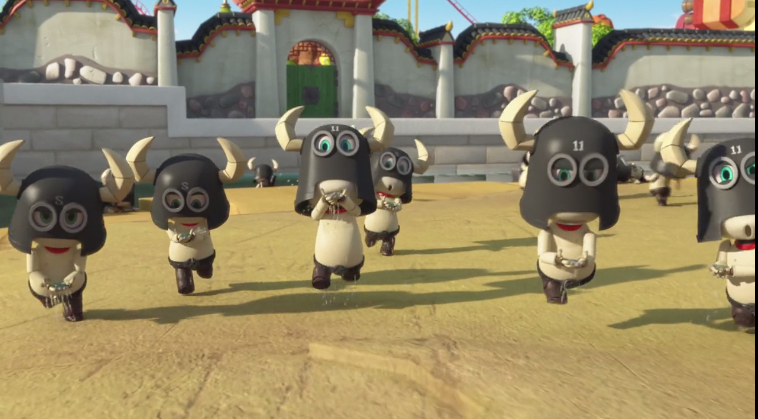 I have to say also that the synchronization of vocals to the animation is often off and looks badly dubbed. Normally I’m fine recommending a film as a babysitter for kids but with the strange messaging and other problems I can’t even do that. There’s so much better out there that you can put the kiddos in front of. Bling just didn’t do it for me I’m afraid. 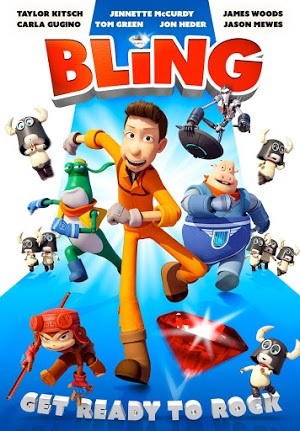 Bling is available in select theaters March 6.